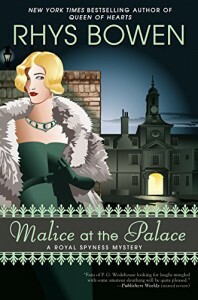 This is the 9th book of 'A Royal Spyness Mystery' series. Lady Georgiana Rannoch is thirty-fifth in line for the British throne unfortunately money doesn't come with the royalty or a place to live. Luckily the Queen "asked" Georgie to be a companion to Princess Marina of Greece who is to wed George, the King's youngest son and stay at the haunted Kensington Palace until the wedding. Her duties are simple: help Marina acclimate to English life, show her the best of London and, above all, dispel any rumors about George’s past affairs with women & men. Nothing spoils a royal wedding more than murder, and the whole matter must be hushed. As always, Georgie is right in the middle of the investigation trying to find the answer to each clue. This a fun mystery for the royal watcher in all of us!